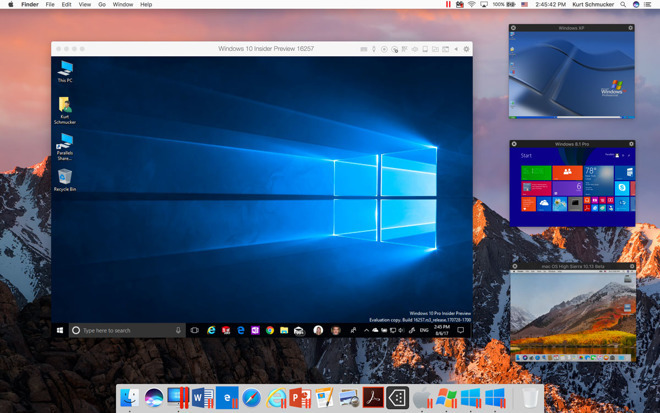 Pushed out to users earlier today, Parallels Desktop 13.1 contains a handful of key features that bring the software in full alignment with macOS High Sierra, Apple's recently released next-generation Mac operating system. Among the most important changes is support for the Apple File System, or APFS. A replacement for the outgoing HFS+, APFS was designed as a fundamentally secure file system that integrates seamlessly across Apple's four major platforms: macOS, iOS, watchOS and tvOS. The file system was built to take advantage of flash memory, a storage technology used in an increasing number of Apple devices. Aside from APFS, Parallels Desktop 13 for Mac now supports the HEVC video codec, Apple's system of choice for iOS 11 and macOS High Sierra. Also called H.265, the advanced codec promises better compression — file sizes up to 40 percent smaller than H.264 — smooth playback and overall higher quality images. Today's update also delivers virtual reality support and compatibility with Steam VR and the HTC Vive VR headset. Enables the user to create a new Boot Camp virtual machine on a Mac with macOS High Sierra. Enables the user to install a High Sierra virtual machine from the Recovery partition on their High Sierra Mac. Resolves an issue with Windows not starting when opening a file associated with a Windows application on macOS. Resolves an issue with "Sending as Attachment" not working for Windows files and Mac email client after suspending and resuming a Windows virtual machine. Resolves an issue with OneDrive for Business not shared with macOS, even if that option is enabled. Resolves an issue with copying Windows files to Mac. Resolves an issue with installing a macOS older than Mac OS X Mavericks 10.9 in the virtual machine from the installation image. Parallels Desktop 13 for Mac saw release in August with macOS High Sierra "readiness," meaning certain features were not supported at launch. Parallels Desktop 13 for Mac sells for $79.99 from the Parallels online store, while existing users can upgrade for $49.99. Alternatively, Parallels Desktop Pro Edition is sold on a $99.99 annual subscription, discounted to $49.99 to existing Parallels 12 or 13 users.